It takes a lot of good things to make up a good company. Good ideas. Good practices. Good execution. And more than anything, good people. It’s how we started. It’s how we intend to grow. Hello! I am a Florida native and grew up in a boating family. I always dreaded the post launch clean up. Yet somewhere along the line I became a neat freak. I began embracing the process and became fascinated with the concepts and science of boat restoration and preservation. So perhaps it was no accident that I would eventually major in and receive degrees in biology and chemistry with honors from Florida State University. While there I rowed for our crew team. When I’m not running the company I’m working in the laboratory, rowing, boating or reading science fiction. Hi! I’ve been in the detailing business for over twenty years. I really started back in elementary school when I swabbed the floors of my parents’ McDonalds franchise and the decks of our 32’ Trojan yacht. My work has included jets and antique and concourse cars. In my free time I’m on my jet skis, visiting the family farm in Louisiana or attending conventions and boat shows. Being on the water and outdoors is where I belong. If I’m not polishing and detailing boats I’m catching live bait for our clients. My hobbies include fishing, free diving, spearfishing and hunting. 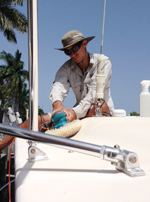 Detailing boats to perfection and exceeding my clients’ expectations is what I strive to do. Hi! I’m originally from Boston and Falmouth Harbor. I spent most of my life in corporate America. A few years ago I moved from Belize and now reside on the water in Delray Beach (the boat is in the backyard). I restored my first wooden boat at age eleven with my older brother (It sunk right afterwards). I’ve been boating ever since and have owned and captained quite a few. Give us a call or use our contact us page for a free estimate. Tell us where you’re docked and we will inspect your vessel and discuss your options at no charge. Hi! I’m Cisco. My boating experiences began as a kid growing up along the shores of Lake Erie. From there I enlisted in The United States Marines Corps. I enjoy being part of the Yolo family. I’ve known them for years so when they asked me to join I didn’t hesitate. They are successful because of their work ethic, attention to detail and personal service. In my spare time I am usually writing music, playing guitar, woodworking and tinkering with or creating something. Hi! Washing boats, polishing metal, climbing towers and assisting where I can is what I do. I cut my teeth cleaning our family boat and learning from others. Most of my time is spent with school and studying. I’ve been playing competitive travel hockey since I was six years old and my teams have won multiple state and national titles. For now I work part time. Hola ! I’m Manuella. I have worked for the Yolo Yacht Services family for two years and they are the nicest people. I love what I do! Chelsea and I use safe products in the living areas. I use vinegar, baking soda, citrus and hydrogen peroxide whenever I can. It is very important to clean and disinfect with products that are safe, especially in living areas. There are so many products on the market that either don’t work as advertised or don’t work as well as others. And because yacht interiors have so many different surfaces it is very important to use the best ones for the best results. And the same is true for our houses! In my spare time I like to cook and ride bicycles with my husband. He owns a bicycle shop in Sunrise, Florida. Hi! I too grew up in South Florida and graduated from FSU. In my free time I’m fishing, diving and woodworking. Improving a boat’s cosmetics and bringing her to the top of the market is what I do!